An extraordinary epic of love, family and war set in the Basque town of Guernica before, during, and after its destruction by the German Luftwaffe during the Spanish Civil War. 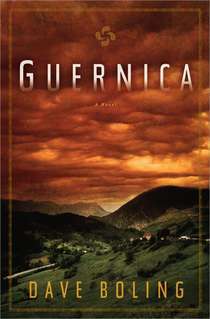 Calling to mind such timeless war-and-love classics as Corelli’s Mandolin and The English Patient, Guernica is a transporting novel that thrums with the power of storytelling and is peopled with characters driven by grit and heart. In 1935, Miguel Navarro finds himself in conflict with the Spanish Civil Guard, and flees the Basque fishing village of Lekeitio to make a new start in Guernica, the center of Basque culture and tradition. In the midst of this isolated bastion of democratic values, Miguel finds more than a new life— he finds someone to live for. Miren Ansotegui is a charismatic and graceful dancer who has her pick of the bachelors in Guernica, but focuses only on the charming and mysterious Miguel. The two discover a love that war and tragedy can not destroy. History and fiction merge seamlessly in this beautiful novel about the resilience of family, love, and tradition in the face of hardship. The bombing of Guernica was a devastating experiment in total warfare by the German Luftwaffe in the run-up to World War II. For Basques, it was an attack on the soul of their ancient nation; for the world, it was an unprecedented crime against humanity. In his first novel, Boling reintroduces the event and paints his own picture of a people so strong, vibrant, and proud that they are willing to do whatever it takes to protect their values, their country, and their loved ones. The idea of starting a blog had always been in the back of mind. I tried many times (from a fashion blog to art blog), but it never stuck to me. Oftentimes, I convinced myself that I was extremely dedicated in it but I actually wasn’t or I found myself second guessing the content of the blog. I ended up putting pictures with no text content in it, which to me, defeats the whole purpose of me starting a blog. I figured that the topics I ventured into was something I was interested in, but it turned out I wasn’t. What differs from the previous times I started blogs is that I have a lot of thoughts toward books and writing. I found myself thinking about what I wanted to write about. One thing people will figure out is that I like to prepare myself beforehand especially when I’m dedicated in a project. As I write, there are tons of drafts waiting for me (all of which have some sort of text already written out). I wanted to do something that will show my thoughts about the things I love, and that is through writing. I rarely express my personal thoughts in a thorough fashion because I feel like I am always incoherent, trying to explain it without being absolutely tongue-tied or being conscious of what I’m saying to the point I don’t say anything at all. However, with this blog, I will attempt to hone it in a way that’s absolutely clear. I know there are already tons of blogs out in the Internet, so what makes this blog so special? To be honest, nothing at all. The content will be different (in what I choose to talk about and read), but I think that’s about it. This blog is more for me in developing my craft and my thoughts. An adventure for an aspiring author, who loves books.